I think I paid a bit too much, but I thought the chance of another HH coming my way was extremely remote. The machine cost me R5000, plus R500 to transport it from Boksburg to Bellville, plus another R500 insurance. Machine condition: Hey, it works :-) The battery is leaking, but there's no functional damage to the PCB yet, the lower playfield is worn where the ball falls down from the upper level, and the playfield under the pop bumber mylar circles is also quite worn. This machine has been fixed before, not all the serial numbers on the various boards match up. The machine serial number is 10313. 2001-01-09: I removed the CPU board to clean the battery damage. Replaced the battery with a 3.6V nicad from an old 80386 motherboard. I downloaded the Black Hole user's manual from the Stork's Nest -- it contains a circuit diagram of the System 80 CPU board. 2012: And when I wasn't looking, the replacement battery leaked all over the CPU board. Some extensive repairs reguired. Damnit. Should have moved the battery offboard back in 2001. My up-kicker coil burnt out, so I had to replace it. At the same time I replaced the fuse with a 2.5A slow-blow, following Clay's notes (which are well worth the money). Testing the coil, I saw why it burnt out in the first place. The K relay contacts arc-ed together and the fuse blew. Here is where I disagree with Clay (well, with his notes from 2011, don't know if he's changed his mind since. You DON'T need the pop bumper driver board modification. 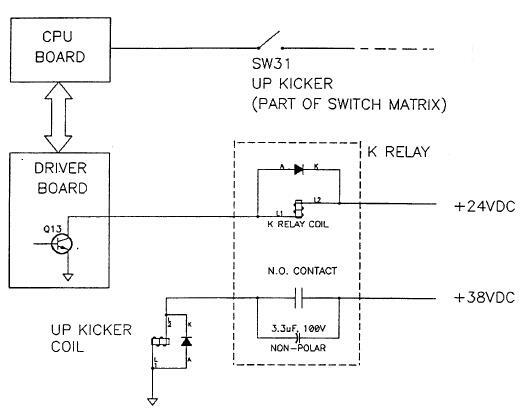 SW31 tells the CPU that there's a ball to be up-kicked, and the CPU then pulses the K relay once which kicks the ball once. This is what the pop bumper driver board also does, except using a one-shot (74121 originally, 4538 in the Rottendog replacement) and not a CPU (well, except for the www.homepin.com solution, which uses a PIC). The problem is that the K relay fails, and my solution is to replace it with a modern transistor. Incidentally, this seems to be what's happening here -- that's a PNP/NPN pair driving the coil, the capacitor provides extra oomph locally, with the oomph held local by the big-arse diode. It might be a hack, but it's not a bad hack. As you can see above, Q31 grounds the output when the coil should fire. This implies either a high-side switch or a two-transistor solution. I opted for the former, using a 17P10 (17A, 10(0) V, P-) mosfet. The +38V line goes to the source, the relay is connected to the drain, and the gate is pulled high with a 10k resistor and low via a 33k resistor to Q31 (The important thing here is that the gate is not allowed to go more than 30V below the source / drain voltage, the resistive divider ensures this). Because of the low on resistance of the 17P10 (less than 0.2 ohm) and the intermittent duty cycle, it doesn't even need a heatsink, but I bolted it to the K relay anyway. Should last forever (I hope). List of rings used on the three playfields.